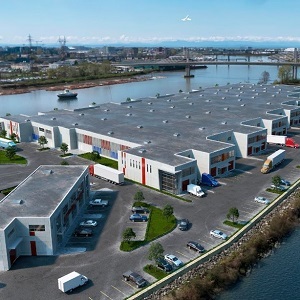 PC Urban Properties’ IntraUrban Rivershore project is literally an island of opportunity in a sea of soaring demand for industrial space in British Columbia’s Lower Mainland. Construction is set to get underway this fall on the commercial condominium development located on Mitchell Island in the Fraser River smack-dab between Vancouver proper and Richmond. At full build, the $68-million development will offer 265,000 square feet of strata units for small and medium-sized businesses on the former site of a steel mill. PC Urban principal Brent Sawchyn says the property sat vacant for 20 years, while commercial properties for industrial use became increasingly scarce in Greater Vancouver. “There really is no industrial land left in Vancouver,” he says, adding vacancy is about two per cent among the 180 million-plus square feet of property zoned for industrial use. So far this year alone, 4.3 million square feet of available industrial space had been leased or sold, he adds. This high demand and low inventory situation made the decision to develop Mitchell Island, a contaminated site in an ecologically sensitive area, a much easier one. Frankly, Sawchyn adds, developers have little choice but to look for opportunity on the few remaining patches of land in Vancouver, which may have been previously overlooked because of the numerous challenges they posed. Rivershore fits that description to a “T”. The site had considerable contamination from its former use as a steel mill that needed to be cleaned up to make it inhabitable. As well, PC Urban — which has a growing reputation in Western Canada for innovative designs across the spectrum of real estate — needed to address a number of other environmental concerns, including protecting two acres of fish habitat. “The site had a myriad of issues, not least of which was challenging soil conditions, but we’re through all that now,” Sawchyn says. Sales are now underway, but because demand is so high for industrial space, the realtor handling the project had already received numerous inquiries in the weeks prior to the official launch. “We have had plenty of offers on the first phase before providing any information about it,” says Bruno Fiorvento, executive vice-president with Jones Lang LaSalle Real Estate Services. A commercial realtor with more than 20 years of experience in the industrial market in Vancouver, Fiorvento says is not surprised by the high interest. While the affordability crisis in Vancouver for residential properties has dominated headlines for several years, a similar quandary exists in the commercial market for light industrial uses. In part, demand is driven by Vancouver’s strategic importance. Beside serving one of Canada’s largest metropolitan areas, the Port of Vancouver is also an incredibly important asset for companies involved in manufacturing and distribution. “Close to one in every five dollars of Canada’s total trade moves in and out of the port, and its influence continues to grow,” he says. To that end, Rivershore’s location is ideal. “Put a dot on the map and it’s in the middle of everything,” Sawchyn says, adding it is very close to the airport as well as having good access to the port and major highway routes. Equally important, the project will also include amenities necessary for businesses in the manufacturing and distribution sectors. While utility is king, aesthetics are also important, including public art to make the spaces more “than four concrete walls and garage doors,” says Sawchyn, adding the project was designed by award-winning architect Chris Bozyk.